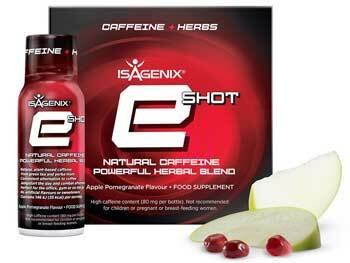 Isagenix Natural Energy Eshots - Buy Eshots in the UK! Isagenix Natural Energy Eshots £ £15.00In stock! Order now! Isagenix E+ provides long-lasting, all-natural energy for everyone from competitive athletes to everyday men and women. Made with a proprietary blend of scientifically proven adaptogenic botanicals and a special blend of yerba mate and green tea, the Isagenix E+ Natural Energy Shot boosts energy, increases stamina, and improves mental alertness in a highly effective yet perfectly safe way. For more information about how this product works, download the full product guide here. Whether you’re an athlete training for an event or an ordinary Joe in need of something to help you get through the day, chances are you’ve found yourself in need of an energy boost from time to time. Although most energy drinks will provide you with an initial energy boost, they’re also typically loaded with sugar, artificial ingredients, and synthetic caffeine, resulting shakiness, nervousness, and the all too common energy crash. Thanks to Isagenix EShots, you can now enjoy energy the healthy way and avoid that inevitable crash! By combining all-natural caffeine from yerba mate and green tea with select healthy botanicals, you can boost your energy, improve your workout performance, and enjoy improved mental clarity for taking care of everyday tasks. With only 35 calories per serving as well, it’s the ultimate healthy performance booster. Caffeine can raise your metabolism and basal metabolic rate. This helps you burn more fat faster, allowing you to reach and maintain your ideal weight. Caffeine is an ergogenic, allowing you to train harder for an extended period of time. According to recent research involving 30 years of controlled studies, moderate doses of caffeine extracted from green tea can boost a runner’s performance. When deprived of sleep or feeling sluggish, the brain doesn’t operate as sharply as it should. The caffeine found in E+ gives you the energy you need to boost your mental focus without the anxiousness often associated with other energy drinks. The E+ Natural Energy Shot contains adaptogenic botanicals, such as rhodiola, schisandra berry, leuzea root, and eleuthero root, which are proven to increase energy, reduce fatigue, and enhance your physical performance. This safe and effective energy tonic truly embraces the power of nature. Adaptogens have been studied for years and have proven to support increased energy and performance by improving cardiovascular function and minimising the perception of effort. They’re an all-natural source of nutrition and deliver powerful nutrients throughout your body. Convenience is the key to using any type of supplement or programme. 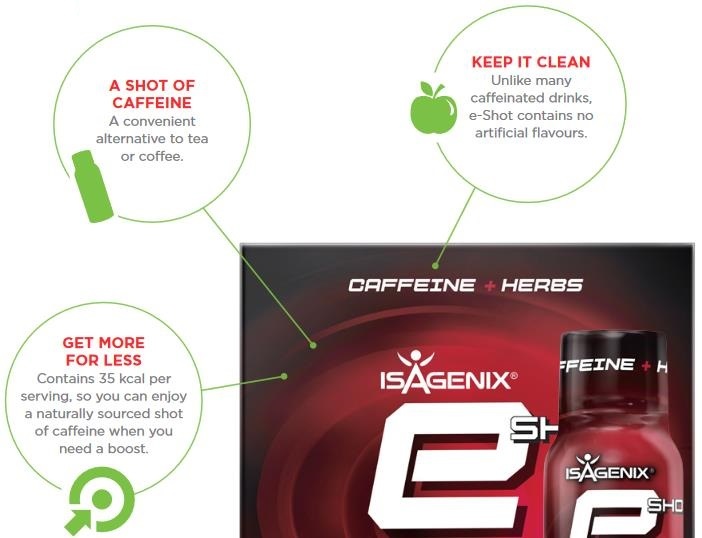 Recognising this, Isagenix products are extremely quick and easy to use, and the E+ Natural Energy Shot is no exception. Designed to fit in your pocket, E+ Natural Energy Shot mini bottles can be taken with you to help fight fatigue and stress wherever you go. Whether you’re competing in a sporting event or trying to stay up late to get a work project finished, the E+ Natural Energy Shot has you covered. The Isagenix E+ Natural Energy Shot stands heads and shoulders above other energy drinks on the market. With naturally-sourced caffeine and a scientifically proven proprietary formula of adaptogenic botanicals, E+ gives you energy and fights fatigue without the artificial ingredients and added sugar found in other energy drinks. The result is an energy shot capable of giving you long-lasting energy, mental clarity, and improved physical performance without harming your health. When Should You Take an E+ Natural Energy Shot? You can take E+ whenever you feel the need for an instant energy boost. Whether you need to take it in the A.M. to jumpstart your day, at lunch to avoid the dreaded mid-day crash, or before a workout to achieve maximum results, the Isagenix E+ Natural Energy Shot will give you the boost you need without the side effects. While you should avoid taking it more than twice per day, it can be used in conjunction with the suite of products in various Isagenix packs for an ultimate health and performance boost! If you want to make the most out of every single workout and perform at your peak, purchase Isagenix Eshots direct from Isagenix UK. Clicking on the Buy Now button below will redirect you to our official Isagenix associate website, where you complete the purchase. How Much is a Box of Isagenix Eshots? Each box of 6 can be purchased for £20 at full retail prices, or sign up with us (UK’s #1 distributor) and pay just £15 per box! Read Isagenix Natural Energy Eshots reviews from real Isagenix UK customers! I first tried these in Australia but having moved to the UK recently was naturally thrilled when Isagenix announced they were opening here. Awesome product for the gym or a big day of work ahead. Very happy I can now purchase locally!